See Fig. 1 for the 100-year view of Secular Bulls and Bears. The CAPE is now at 32.42, up from the prior week’s 31.66, and still exceeds the level reached at the pre-crash high in October, 2007. This value is in the lower end of the “mania” range. 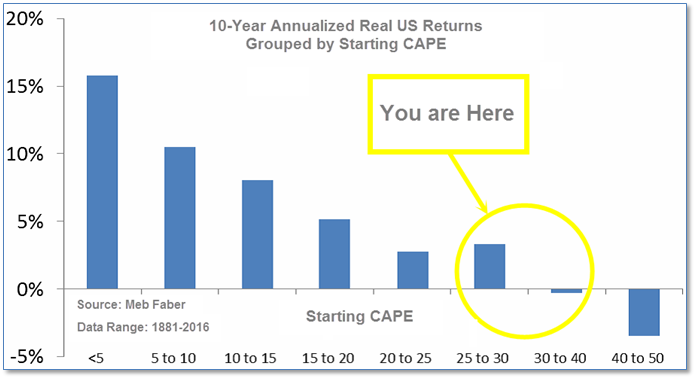 Since 1881, the average annual return for all ten year periods that began with a CAPE around this level have been in the 0% – 3%/yr. range. (see Fig. 2). The “big picture” is the months-to-years timeframe – the timeframe in which Cyclical Bulls and Bears operate. 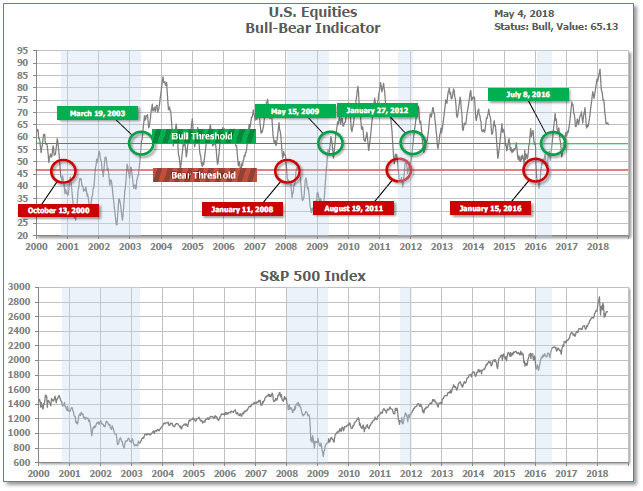 The U.S. Bull-Bear Indicator (see Fig. 3) is in Cyclical Bull territory at 66.94, up from the prior week’s 65.13. The Shorter-term (weeks to months) Indicator (see Fig. 4) turned positive on April 3rd. The indicator ended the week at 11, up from the prior week’s 10. Separately, the Intermediate-term Quarterly Trend Indicator – based on domestic and international stock trend status at the start of each quarter – was negative entering April, indicating poor prospects for equities in the second quarter of 2018. U.S. Markets: Stocks recorded solid gains this week as the major indexes moved back into positive territory for the year to date. The large cap S&P 500 achieved its best weekly advance in two months and closed above its key 100-day moving average for the first time since mid-March. The Dow Jones Industrial Average rallied 568 points, or 2.3%, to close at 24,831. The technology-heavy NASDAQ Composite added 2.7% closing at 7,402. By market cap, the large cap S&P 500 index gained 2.4%, while the mid cap S&P 400 and small cap Russell 2000 added 2.2% and 2.6%, respectively. International Markets: Canada’s TSX closed up for the fifth consecutive week by rising 1.6%. Across the Atlantic, the United Kingdom’s FTSE recorded its seventh consecutive week of gains, adding 2.1%. On Europe’s mainland, France’s CAC 40 added 0.5%, while Germany’s DAX rose 1.4%, and Italy’s Milan FTSE retreated -0.7%. In Asia, China’s Shanghai Composite index rose 2.3%, its third straight week of gains. Japan’s Nikkei closed up for a seventh straight week rising 1.3%. Hong Kong’s Hang Seng index rebounded from last week’s drop and closed up 4%. As grouped by Morgan Stanley Capital International, developed markets rose 1.2% last week, while emerging markets gained 2.1%. Commodities: Precious metals recovered from their weakness last week with gold rising 0.5%, or $8, to close at $1320.70 an ounce. Silver also finished up by 1.4% to end the week at $16.75 an ounce. West Texas Intermediate crude oil continued its ascent, rising four out of the last five weeks and closing at $70.70 per barrel, a gain of 1.4%. Copper, the industrial metal viewed by some analysts as a measure of global economic health, rose 0.84%. U.S. Economic News: The number of people applying for new unemployment benefits held steady for the second week in a row, according to the Labor Department. New claims remained flat at 211,000 in the week ended May 5, the government reported. Economists had expected a slight rise to 215,000. The four-week average of new claims, used to smooth out the weekly volatility, fell by 5,500 to 216,000—its lowest level since December of 1969. Continuing claims, which counts the number of people already receiving unemployment benefits, rose by 30,000 to 1.79 million. For the first time ever, there’s now a job opening available for each and every unemployed worker. According to the Labor Department’s Job Openings and Labor Turnover Survey (JOLTS), there were 6.6 million job openings in March, compared to 6.59 million unemployed workers. Job openings in total rose by 472,000 in March. In the details of the report, professional and business services added 112,000 positions, construction added 68,000, and the transportation, warehousing and utilities sectors added 37,000 new positions. The Quits rate in the JOLTS report, watched closely by the Fed, rose by 136,000 to 3.34 million. Counterintuitively, a higher quit rate is a good thing – it is presumed that workers only quit jobs if better opportunities are plentifully available. Consumer credit grew at its slowest rate in 6 months according to the latest data from the Federal Reserve. The Fed reported consumer credit grew in March at a seasonally-adjusted 3.6%, or $11.6 billion, marking its slowest gain since September. The reading fell short of economists’ expectations of a $13.6 billion advance. Non-revolving credit, which includes student and auto loans, grew by 6%–the third consecutive month of growth for that category. Revolving credit, primarily credit cards, fell 3% marking its second drop in a row. Economists expect with rising employment and growing gains in income, consumer credit should continue to increase. However, while credit growth averaged above 7% in 2014 and 2015, it’s currently running at just an annualized 4.25% through the first quarter. Sentiment among the nation’s small-business owners ticked up just a slight bit in April as the surge in optimism following last year’s tax cuts appears to be slowing its ascent. National Federation of Independent Business (NFIB) reported its small-business optimism index rose 0.1 point to 104.8 last month. The confidence index soared to new highs after tax cuts were passed last year, but it has struggled to maintain its momentum. Despite the lackluster headline number, the NFIB highlighted a surge in the index of expected profit trends, which hit its highest level in the survey’s 45-year history. The NFIB said in its’ statement, “The optimism small businesses owners have about the economy is turning into new job creation, increased wages and benefits, and investment.” Survey respondents continued to report that the biggest problem they face is finding qualified workers. Prices at the wholesale level barely rose last month after strong gains in the first quarter, according to the latest producer price index reading. The Labor Department reported its Producer Price index (PPI) rose 0.1% in April, missing economists’ estimates of a 0.3% rise. The slight increase, held down by moderation in the cost of both goods and services, should ease fears that inflation pressures are rapidly building. However, analysts were quick to point out that the slowdown in wholesale price growth is likely temporary as manufacturers continue to report paying more for their raw materials. Year-over-year, the PPI is up 2.6%, down 0.4% from March. At the consumer level, the Labor Department reported that the Consumer Price Index (CPI) rose 0.2% last month after slipping 0.1% in March. In the 12 months through April, the CPI increased 2.5%. In the report, rising costs for gas and rental accommodations were tempered by a moderation in healthcare prices. Excluding the volatile food and energy components, the so-called core CPI edged up 0.1% after two straight monthly increases of 0.2%. Year-over-year, core CPI is up 2.1%. While the Federal Reserve has publicly stated it targets a 2% rate of inflation, the Fed uses a different inflation measure for this purpose. This measure, called the Personal Consumption Expenditures (PCE) price index is currently sitting at 1.9%. Economists expect the core PCE price index to breach the Fed’s target this month. International Economic News: The Bank of Canada’s senior deputy governor called for more diverse perspectives at the bank, stating that the bank risks falling into an “echo chamber” that reinforces the same viewpoint. Governor Carolyn Wilkins said that such a move may not seem relevant for a central bank at first, but diverse views are crucial going forward as the Bank of Canada takes on modern economic challenges such as digitalization, cryptocurrencies, and a new economy. At the G7 Women’s Forum in Toronto Wilkins remarked, “We’re doing projects where we actually require that diversity of thought.” Wilkins comments came as she discussed the benefits of an inclusive economy and the challenges to achieving it. France’s Foreign Minister said European countries should push back harder against the Trump administration over the Iran nuclear deal. Jean-Yves Le Drian stated that France wanted to stick with the nuclear accord that Tehran had agreed with world powers in 2015—a pact which he said Iran had honored. Similarly, French Finance Minister Bruno Le Maire said that Europe should not accept that the U.S. is the “world’s economic policeman”. “Do we want to be vassals who obey decisions taken by the United States while clinging to the hem of their trousers?” Le Maire asked. “Or do we want to say we have our economic interests, we consider we will continue to do trade with Iran?” French President Emmanuel Macron is scheduled to speak to his Iranian counterpart Hassan Rouhani. A stronger-than-expected rebound in German industrial output in March and an increase in exports helped ease concerns that Europe’s economic powerhouse had come to a standstill at the beginning of the year. The Federal Statistics Office said industrial production rose 1% in March, its strongest increase since November and better than the expectations of a 0.8% rise. The Economy Ministry pronounced, “The upswing remains intact.” The government expects growth of 2.3 percent this year, up from 2.2 percent in 2017. The bullish output and export figures brought some relief after weak data for January and February pointed to a massive slowdown in the first quarter. “Rebounding exports and industrial production show that talk of a downswing has been premature,” ING Bank economist Carsten Brzeski said. President Xi Jinping of China has dispatched his top economic advisor Liu He to Washington this week for another round of trade negotiations with his counterparts in the Trump administration. China is eager to dissuade President Trump from imposing sanctions on Chinese imports which would trigger retaliation in kind. President Trump’s administration has rolled out a major trade initiative that could implement tariffs on $50 billion in Chinese imports as soon as this month, with the option of adding tariffs on another $100 billion. Last week, top U.S. economic officials including Treasury Secretary Steven Mnuchin traveled to China for talks. The U.S. asked China to cut its trade surplus by $200 billion, while China sought to get Washington to ease national-security reviews of Chinese investments. The talks ended inconclusively. Household spending in Japan fell 0.7% in March from a year earlier marking its second consecutive month of declines. Weak consumer spending could prove to be troubling for the Bank of Japan, which had hoped that rising costs from companies would be passed on to consumers and help drive up inflation to its 2 percent target. Analysts were quick to point out that bad weather was likely the cause for the reduced consumption in the first quarter, and that the lull is likely temporary. “The economy is expected to return to the pace of around annualized 1.0 percent growth from April-June but we need to pay attention to impacts from the United States’ trade protectionism including the currency movements,” said Yusuke Ichikawa, senior economist at Mizuho Research Institute. Finally: Stock market bulls got something to cheer about last week. Heritage Capital President Paul Schatz noted that New York Stock Exchange’s advance/decline line set a new all-time high this week. The indicator counts the number of stocks rising on a particular day and subtracts the number of stocks falling and plots the result over time. “When the major stock market indices make new highs but the NYSE A/D Line does not, that’s where bulls should begin to worry,” Schatz writes, adding that “the exact opposite is now happening,” which he said was “typically a good sign for further strength in stocks over the medium-term.” Still, he added the obligatory caution that past performance is no guarantee of future results. The ranking relationship (shown in Fig. 5) between the defensive SHUT sectors (“S”=Staples [a.k.a. consumer non-cyclical], “H”=Healthcare, “U”=Utilities and “T”=Telecom) and the offensive DIME sectors (“D”=Discretionary [a.k.a. Consumer Cyclical], “I”=Industrial, “M”=Materials, “E”=Energy), is one way to gauge institutional investor sentiment in the market. The average ranking of Defensive SHUT sectors fell to 24.50 from the prior week’s 20.25, while the average ranking of Offensive DIME sectors fell to 12.00 from the prior week’s 11.25. The Offensive DIME sectors expanded their lead over the Defensive SHUT sectors. Note: these are “ranks”, not “scores”, so smaller numbers are higher ranks and larger numbers are lower ranks. See Fig. 1 for the 100-year view of Secular Bulls and Bears. The CAPE is now at 31.66, down slightly from the prior week’s 31.73, and still exceeds the level reached at the pre-crash high in October, 2007. This value is in the lower end of the “mania” range. Since 1881, the average annual return for all ten year periods that began with a CAPE around this level have been in the 0% – 3%/yr. range. (see Fig. 2). 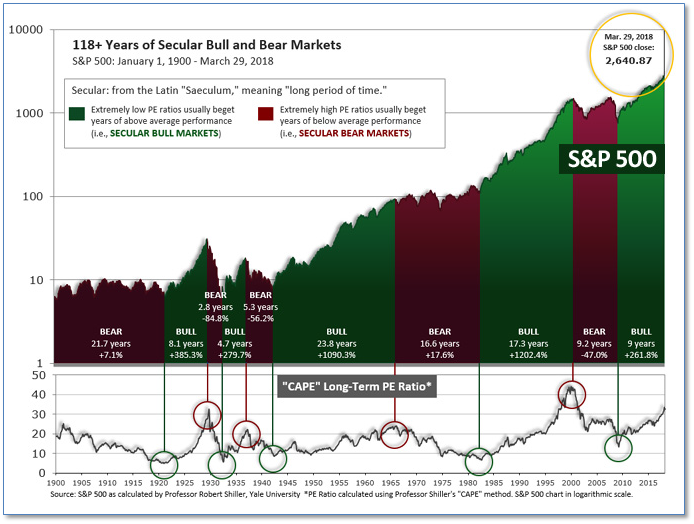 The “big picture” is the months-to-years timeframe – the timeframe in which Cyclical Bulls and Bears operate. 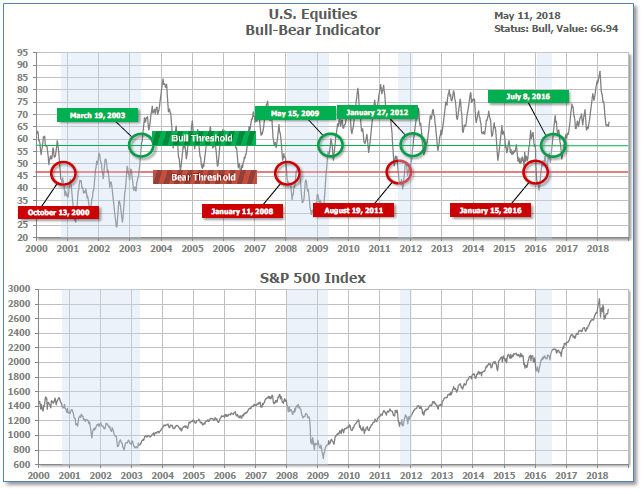 The U.S. Bull-Bear Indicator (see Fig. 3) is in Cyclical Bull territory at 65.13, down slightly from the prior week’s 65.78. The Shorter-term (weeks to months) Indicator (see Fig. 4) turned positive on April 3rd. The indicator ended the week at 10, down from the prior week’s 13. Separately, the Intermediate-term Quarterly Trend Indicator – based on domestic and international stock trend status at the start of each quarter – was negative entering April, indicating poor prospects for equities in the second quarter of 2018. U.S. Markets: The major U.S. stock indexes ended the week in mixed fashion, helped by a strong finish to the week that mostly compensated for a poor start. 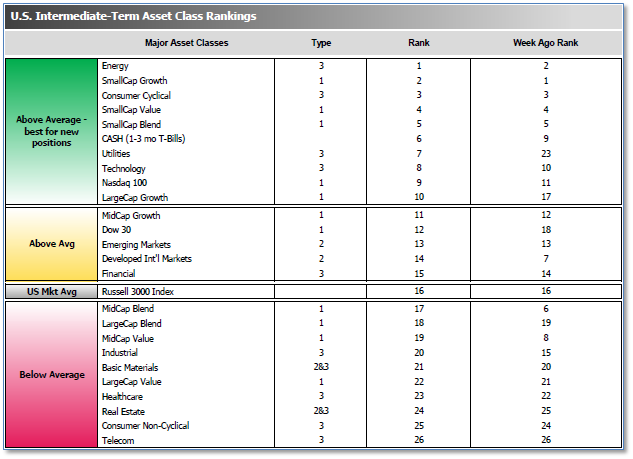 The NASDAQ Composite performed the best, helped in particular by a strong performance by heavily-weighted Apple. The Dow Jones Industrial Average finished the week down 48 points closing at 24,262, a loss of -0.2%. The NASDAQ Composite rose 89 points, or 1.3%, ending the week at 7,209. By market cap, smaller cap stocks ended the week in positive territory with the small cap Russell 2000 adding 0.6% and the mid cap S&P 400 index rising 0.3%, while the large cap S&P 500 declined -0.2%. International Markets: Canada’s TSX rallied for a fourth consecutive week, ending the week up 0.4%. An even longer winning streak is found in the United Kingdom’s FTSE, which rose a sixth straight week, up 0.9%. Markets were also positive on Europe’s mainland, where France’s CAC 40 gained 0.6%, Germany’s DAX surged 1.9%, and Italy’s Milan FTSE gained 1.7%. In Asia, China’s Shanghai Composite rose for a second week adding 0.3%, while Japan’s Nikkei ended the week flat. Most international markets were negative, however, did not do nearly as well as the “headline” markets mentioned above. As grouped by Morgan Stanley Capital International, developed markets finished the week down -0.1%, while emerging markets slipped -1.8%. Commodities: The rally in energy continued. West Texas Intermediate crude oil rose 2.4% to close at $69.72 per barrel. Precious metals finished the week mixes with Gold falling -0.7% to close at $1314.70 an ounce, while Silver managed a slight gain by rising 0.1% to close at $16.52 an ounce. Copper, seen as a barometer of global economic health due to its variety of uses, rose 0.7% for the week. April Summary: For the month of April, the Dow Jones Industrial Average added 0.3%, while the Nasdaq Composite ended the month essentially flat, up just 0.04%. By market cap, the large cap S&P 500 added 0.3%, the mid cap S&P 400 gave up -0.3%, and the small cap Russell 2000 gained 0.8%. Developed International markets on the whole did much better than the U.S. market, while Emerging International markets lagged for themonth. Canada’s TSX gained 1.6%, while the United Kingdom’s FTSE surged 6.4%. On Europe’s mainland, France’s CAC 40 rallied 6.8%, Germany’s DAX added 4.3%, and Italy’s Milan FTSE jumped 7%. In Asia, China’s Shanghai Composite ended the month down -2.7%, while Japan’s Nikkei rallied 4.7%. Developed markets finished the month of April up 1.5%, while emerging markets were down -2.8%. Precious metals were mixed for the month with Silver rising 0.8% but Gold retreating -0.6%. The industrial metal copper ended the month up 0.9%. Energy had its third consecutive month of gains as West Texas Intermediate crude oil rallied a robust 5.6%. U.S. Economic News: After falling to its lowest level since 1969 last week, initial jobless claims rebounded only slightly to 211,000, according to the Labor Department. The reading was still far below the average of 225,000 forecast by economists. The more stable four week average of claims decreased by 7,750 to 221,500—its lowest reading since March of 1973. Looking at the big picture, the U.S. labor market is in its best shape of the nine-year economic expansion. The low level of claims suggests that solid job growth will continue and the unemployment rate will continue to fall. Continuing claims, which counts the number of people already receiving unemployment benefits, fell by 77,000 to 1.76 million. The unemployment rate fell to a 17-year low and the U.S. added 164,000 new jobs in April, according to the Bureau of Labor Statistics’ Non-Farm Payrolls report. The nation’s unemployment rate fell 0.2% to 3.9%, after holding at 4.1% for six months in a row. The increase in new jobs was led by professional businesses, which added 54,000 workers. Hiring also rose among health care providers and manufacturers, each of which added 24,000 jobs. Construction firms increased payrolls by 17,000. The tight labor market is also evident in the so-called “real” or “U-6” unemployment rate. The U6 rate also includes people who can only find part-time work and those that are no longer looking for a job. The U6 rate fell to 7.8% in April, the first time it’s dropped below 8% since 2006. Spending by the nation’s consumers increased 0.4% in March after remaining unchanged in February, the Commerce Department reported. On an annualized basis, consumer spending grew at a 1.1% annualized rate in the first quarter—its slowest in almost five years. Data showed Americans spent more on new cars and trucks and paid more to heat and power their homes. Consumer spending accounts for roughly two-thirds of the nation’s economic activity. A gauge of manufacturing activity in the Chicago region ticked higher in April, but remained well below its year-to-date high. The Chicago Purchasing Managers’ Index for April came in at 57.6, missing economists’ expectations for a reading of 59.3 and not rebounding nearly as much as economists had hoped from March’s plunge. While the report still indicates healthy activity, as readings above 50 indicate improving conditions, the last two months’ readings are down significantly from last winter. The new-orders growth hit a concerning 15-month low. Nationwide, manufacturers grew at a slower pace in April, hindered by higher prices for raw materials such as steel and continued skilled labor shortages, according to the Institute for Supply Management (ISM). The ISM manufacturing index fell to 57.3 last month, down 2 points from December. The reading missed economists’ forecasts who had expected a stronger reading of 58.7. In the report, most executives said their firms are growing and business is still very strong, but they complained about higher prices for steel following the recent U.S. tariffs. The cost of other materials also continued to rise, and many firms continue to report difficulty finding workers. In the details, ISM’s index for new orders was little changed at 61.2, but production fell 3.8 points to 57.2. The employment gauge slipped 3.1 points to its lowest level in almost a year. Overall the U.S. economy continues to expand at a healthy pace, now almost nine years since the last recession. Analysts note that such a long period of growth is bound to give rise to higher inflation, especially given the low unemployment rate. The U.S. trade deficit fell to a 6-month low of $49 billion in March, but analysts note that the trade gap is unlikely to fall much further. Despite the 15% decline, the U.S. remains on track to run another large trade deficit in 2018 that exceeds the deficit of 2017. In the report, exports advanced 2% to $208.5 billion and set a new record. The U.S. shipped more petroleum, passenger planes, and agricultural products ahead of pending tariffs by China. U.S. imports dropped 1.8% to $257.5 billion as the U.S. imported far fewer consumer electronics, toys, appliances, wine and beer. The U.S. trade deficit in goods increased with all its major trading partners except China. More American-made goods were sent to China and fewer Chinese goods were received in the U.S. in March. Inflation hit the Federal Reserve’s 2% target for the first time in a year according to its preferred inflation measure and fell just short in another measure. The Federal Reserve’s preferred inflation barometer, the Personal Consumption Expenditures (PCE) index reached 2% year-over-year in March, a 0.3% gain from February. In addition, the closely followed core inflation rate, which measures price increases without the volatile food and energy sectors, rose to a 12-month high of 1.9% year-over-year. That’s the biggest yearly gain in the core rate since April 2012. Overall, inflation has been increasing steadily for months due to the rising cost of oil, higher home prices, and the tightest labor market in decades. While still low by historical standards, the Fed may be inclined to raise interest rates more aggressively to ensure it doesn’t get out of hand. The Federal Reserve left its key U.S. interest rate unchanged this week, but the central bank acknowledged prices were rising and that it now expects inflation to “run near” its 2% target “over the medium term”. The somewhat more hawkish language by the FOMC about price levels, suggests the Fed is paying closer attention to inflation, but is not unduly alarmed. Analysts note the changes in the central bank’s policy statement could boost expectations that the Fed will raise its benchmark interest rate four times this year, instead of the three previously planned. The vote to hold rates steady was 8-0. The United Kingdom’s economy remains stuck in the slow lane as its services sector grew at a slower-than-expected pace last month. Research firm IHS Markit reported its Purchasing Managers’ Index (PMI) for the industry saw only a modest rebound from the almost 2-year low posted in March. The reading of 52.8 was the weakest services PMI reading since September of 2016. Based on its three industry surveys, Markit estimates an expansion in the United Kingdom consistent with a “disappointingly subdued” quarterly rate of 0.25%. While 0.25% is an improvement over the 0.1% seen in the first quarter, it’s considerably slower than the growth seen in the second half of last year. Intermittent strikes against the new economic reforms enacted by French President Emmanuel Macron may be the toughest test yet for the new president. Strikes continue to target the national state-owned railway company SNCF where protest leaders say the strikes are set to last at least three months. The French government is seeking to reform the railway sector before the summer. The SNCF has a staggering $57.7 billion debt which is compromising future investment. In February, Edouard Philippe, the Prime Minister, outlined plans to open up the rail monopoly to competition. The government decided to stop short of privatization but said the SNCF should nevertheless be placed on equal footing with private competitors. As Europe’s biggest exporter to the United States and with more than a million jobs on the line, Germany is desperate to avoid a European Union trade war with America. As the June 1 deadline nears when U.S. President Donald Trump has threatened to impose steel and aluminum tariffs on the EU, Berlin is urging its European partners to show flexibility and to pursue a broad trade deal that benefits both sides. However, that puts Germany at odds with its peers such as France. The other major power for European integration is distancing itself from Germany’s sentiment and wants a tougher EU stance against the U.S. tariffs. Holger Bingmann, president of Germany’s BGA Foreign Trade Association stated, “There is a great danger of slipping into a trade war that way.” The European Commission has said the EU will set duties on 2.8 billion euros ($3.36 billion) of U.S. exports, including peanut butter and denim jeans, if its metals exports to the United States, worth 6.4 billion euros, are subjected to tariffs. The Chinese economy, the world’s second-largest, remained strong in April, supported by an uptick in industrial output and a rebound in exports despite its rising trade tensions with the United States. China’s economy grew at a slightly faster-than-expected annualized pace of 6.8% in the first quarter, but economists still expect growth to slow significantly by the end of the year. In talks late this week, the U.S. and China reached a consensus on some areas of their trade dispute, but are still relatively far apart on other issues, Chinese state media reported. U.S. President Donald Trump has threatened $150 billion in new tariffs on Chinese imports, though none of the tariffs have been implemented yet. After six years of solid growth, Japan’s economy likely slowed in the first quarter of the year data from the Finance Ministry showed. Rising prices for everyday goods weighed on consumers while declining exports of electronic parts and other items raised questions about global economic health. Analysts estimate export values grew just 0.5% in the first quarter, year-over-year, down from two consecutive quarter of growth in the 2% range. Though one quarterly decline doesn’t necessarily mean Japan’s broader recovery is over, the deceleration in global exports raises questions about the strength of global demand. The prevailing view from a consensus of twelve private research firms holds that Japan will regain an annualized growth rate in the 1% range in the second quarter of the year and beyond. Finally: In the dustbowl days of the depression, signs taped to westbound Model T’s frequently said “California Or Bust”. But now, eastbound cars might as well have signs taped to them saying “Busted by California”! With the median sale price for a home in California now more than double the national average, citizens continue to exit the state in sizeable numbers. 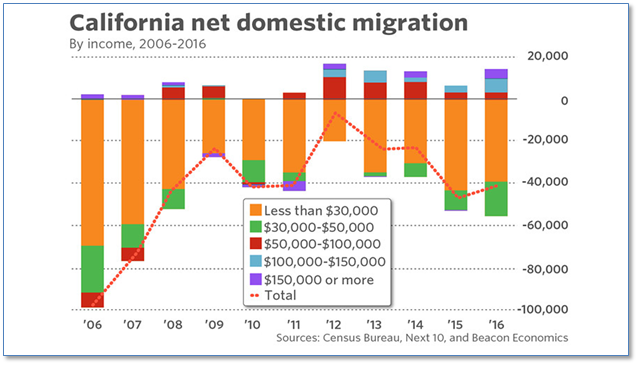 From 2006 to 2016 over a million more people moved out of California than moved in, with the high cost of housing appearing to be the #1 cause. A report from Next 10 and Beacon Economics showed that the high cost of housing is hitting lower-income people the hardest, driving them to more affordable neighboring states. Most people leaving the state earn $50,000 or less per year. 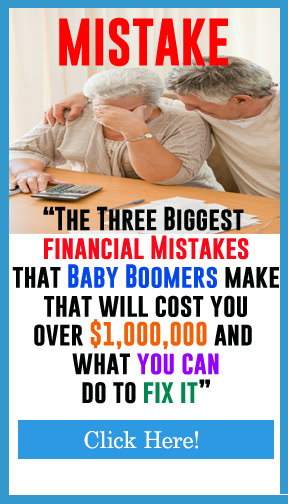 And while California is a still a net importer of highly educated professionals in the information, professional, and technical sectors that can afford the higher cost of homes, the accommodation, construction, manufacturing, and retail trade sectors are experiencing a huge exodus. Who will be left to serve drinks and food, turn down the sheets, build and clean the houses of all those software engineers? The ranking relationship (shown in Fig. 5) between the defensive SHUT sectors (“S”=Staples [a.k.a. 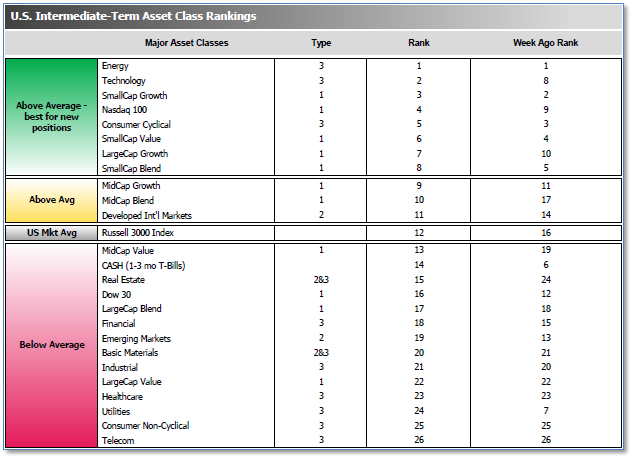 consumer non-cyclical], “H”=Healthcare, “U”=Utilities and “T”=Telecom) and the offensive DIME sectors (“D”=Discretionary [a.k.a. Consumer Cyclical], “I”=Industrial, “M”=Materials, “E”=Energy), is one way to gauge institutional investor sentiment in the market. The average ranking of Defensive SHUT sectors fell to 20.25 from the prior week’s 23.75, while the average ranking of Offensive DIME sectors fell to 11.25 from the prior week’s 10.00. The Offensive DIME sectors lost some of their lead over the Defensive SHUT sectors. Note: these are “ranks”, not “scores”, so smaller numbers are higher ranks and larger numbers are lower ranks.